Metalguard offers metal building wall and roof replacement services, including cut and paste. We can replace all panels, or just some panel sections, based on the conditions, and your budget. Different options to repair damaged panels, steel and rusted metal roofs, are provided at no cost. Call for a free quote. 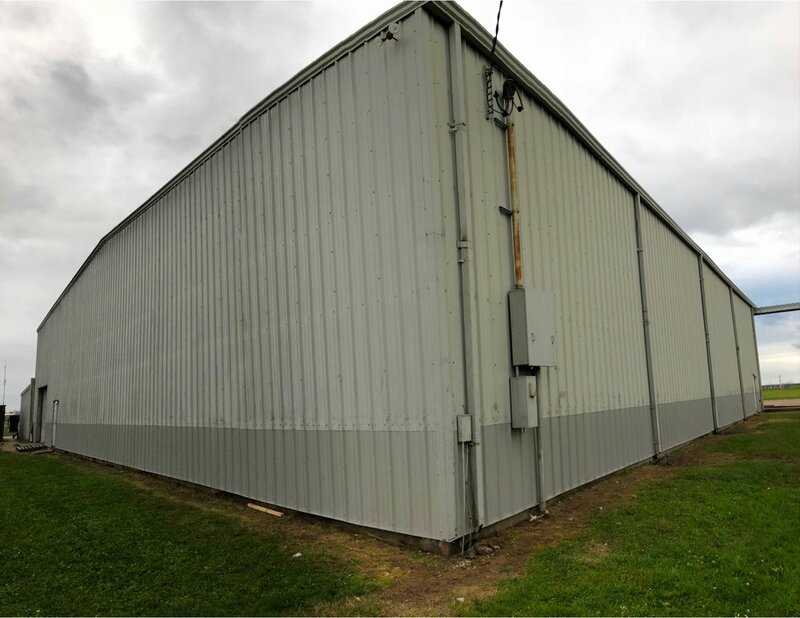 Metal building wall and roof repairs, panel cut and paste repairs, save money by only replacing the damaged metal panel sections. 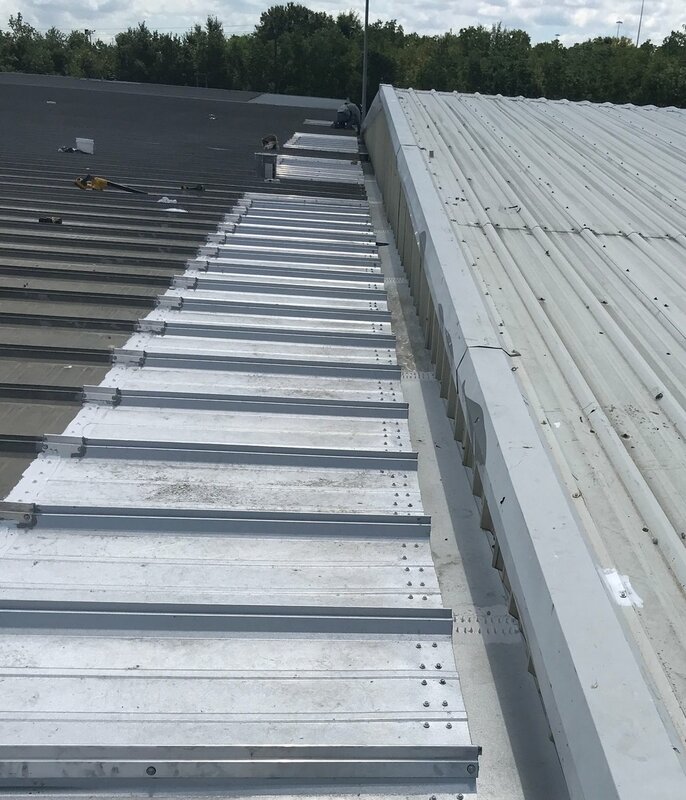 Below, we cut out the rusted out standing seam panels at the eave and replaced the internal gutter in this cut and paste repair. No more leaks! Location, Houston, TX. Completed November 2018. We replace the rotted out standing seam roof panels at the eave and also replaced the internal gutter. Some of these panels were pushed out, we completed a cut and paste repair on these wall panels and repaired the base angle also. Cut and paste repair on the wall panels, completed August 2019. Above: Picture before the metal wall panels were replaced, panels rusted out at the bottom and dented. Old signage and old windows. Below: Windows removed, entry door replaced, metal building wall panels have been replaced. An accent color is going to be added, using a cut and paste, to provide a contrasting color for the metal wall panels. Wall panel replacement with an off-set look. We removed the old windows for a clean look, plus a two tone look. Metal wall panel cut and paste: A common question is; do I have to replace all of my metal roof or wall panels, or can I just replace the defective, or damaged metal sections? Thats up to you! In the above metal building repair, the bottom of the wall panels had been damaged by materials being piled in front of the building and pushed in. The building owner decided to save money and just replace the damaged section for this building in Houston, TX. Paint your walls of replace them? If you have rust at the base of your buildings wall panels paint won't help. Also, good paint will last 5 to 7 years, wall panels 20 to 40 years (depends on your environment). Consider replacing your panels call 800-231-6971 for a no cost estimate. Cut and Paste: The damaged sections of the metal wall panels were replaced, the bottom 4'. The bottom of the metal building wall panel was rusted out and pushed out in places on this airport hangar. The bottom 4' of metal wall panel, base angle and insulation were replaced. The panels are the same color, the old top panels are just dirty. This was much affordable than replacing the entire panel. 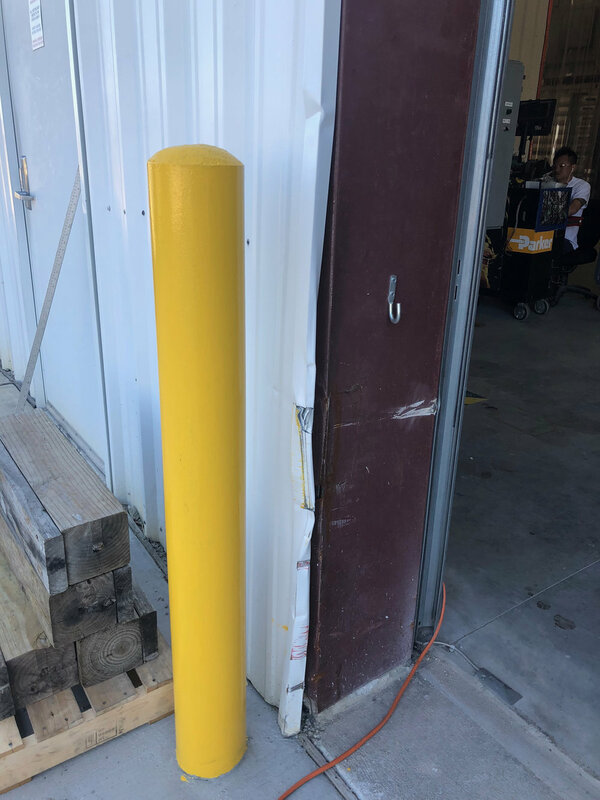 A truck damaged the bollard (and concrete base), the overhead door and wall panel. This happens all the time. We replaced them all. This shows after the bollard and concrete repair, but before the steel repair. 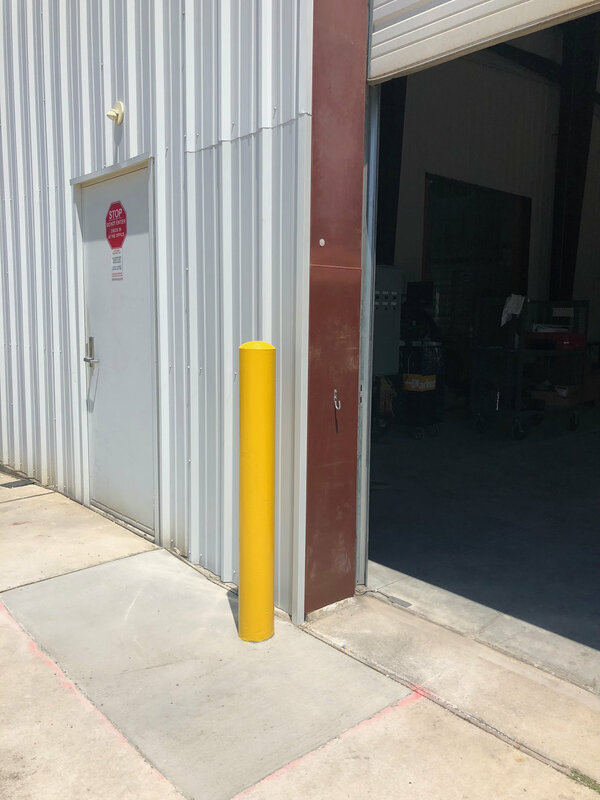 Our cement crew repaired the cement and installed the bollard. Below, after cutting and welding the C-ee channel and a cut and paste repair to the metal panel and trim. The bollard and the damaged cement were also replaced. Metal building rusting wall panel replacement, before and after pictures. The rusting metal building wall panels replaced with modern color and metal wall panel profile. Insulation also replaced, new facing, upgraded R-value. We replaced the old gutters and downspouts also. Replacing metal wall panels with a upgraded profile. During the metal wall panel replacement, includes new insulation. Three existing doors are also being replaced with new metal doors. We installed trim at the base 18" high and sealed the seams. Water has come into the building during heavy rains at the the bottom of the building. Keeping water from coming into the building at the pad, or cement, during heavy rains. In addition to the new metal wall panels, the doors were replaced. Metal building before the rusting metal R panel roof and walls were replaced. This metal building has good structure, it just needed panels. The building needed the rusting metal wall panels and rusted metal roof panels repaired. Metal building after the rusting metal roof and metal walls were replaced. Looks like new. Rusted metal roof replacement, metal building wall panel replacement. Framed out and installed new overhead door. Metal roof leak repair - Metal roof cut and paste due to Metal roof leaks at the eave, or the edge is due to failed closures or the lack of closures. Metal roof leak repair - Metal roof cost and paste before picture. Met building roof panel that were rusted out at the eave, eave leaks on a metal roof due to failed closure. Metal roof leak repair - Leaks along the edge, or eave, of a metal roof is extremely common. It is due to improper installation failure of closures at the eave between the bottom of the roof panel and the eave strut. As part of our repair process we follow Metalguard repair procedures. We seal the metal roof eave to prevent this from happening in the future. The reason the metal roof panels rot out at the eave of the roof is because the metal building insulation gets wet. It stays wet ant rusts out the underside of the roof panel. All because of improper eave detail. Metal roof leak repair - Metal roof leaks at the eave of a metal roof. Closure was never installed, Water backed up from the gutter under the roof panel keeping the insulation wet. The bottom is always rusted out more than the top. Metal roof leak repair - If closures are not installed, as they were not in the above picture, water can back up between the bottom of the roof panel and the eave strut, which is the part of the steel structure of a metal building where the metal roof panels are fastened to at the eave. It is common for the insulation to be folded back to keep water from entering the building. The problem is the insulation vinyl facing starts to dry out, it becomes brittle and delaminates. The fiberglass insulation starts to hold water and starts rusting the roof from the bottom. The rusting starts at the holes in the roof made by the eave fasteners. It won't leak at first, unless its a very heavy rain, but the roof is being damaged. Metal building leak repair - metal roof cut and paste. The old panels were removed along with the damaged insulation and new closures were installed and sealed. Just the damaged parts were replaced - a cut and paste repair. After: Replaced metal building roof panels- cut and paste. Below: this metal roof section had been sealed many times in the past. It really needed to be replaced, there were holes in it. Above: After this metal roof cut and paste was complete the leaks stopped. Before, a metal roof skylight the building owner wanted removed. After: Removing a raised skylight on a standing seam metal roof and replacing it with a metal roof panel including insulation. Cut and paste repair. Cap repair trim at skylight transition.